Size of this preview: 800 × 584 pixels. Other resolutions: 320 × 234 pixels | 640 × 468 pixels | 1,024 × 748 pixels. 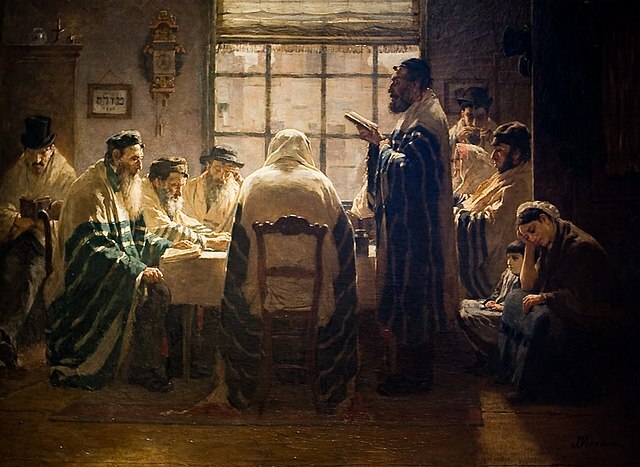 An oil painting with from left to right: Interior with four seated men dressed in tallit, a figure viewed from the back, a reader in tallit standing and facing to the left, two men, two women and a child, the scene around a table in front of a window, open door on the far right.